I first got to know Mary Ruth Hammond when I read her sensitive and compelling From the Heart columns in the Transcript Bulletin. When she “retired” from doing that, I would see her sometimes in Grantsville. I loved talking to her as we had a lot in common, including a passion for writing. In November 2013, she attended my Chamber Business After Hours. Afterwards, she asked me if I could help her out with a project that’s been on her to-do list for years: a book compilation of her son Troy’s missionary letters and photos from 1991-92, when he served in the LDS Church Texas Fort Worth mission. She’d collected all this memorabilia and had already typed up the letters in Word documents. It would be a surprise for Troy’s birthday in early January. In six intense but fun weeks, my designer Mariah and I collaborated with Mary Ruth, who worked round the clock to give us feedback on the drafts and design. One of the biggest joys for me in working on this project was getting to know their family better. 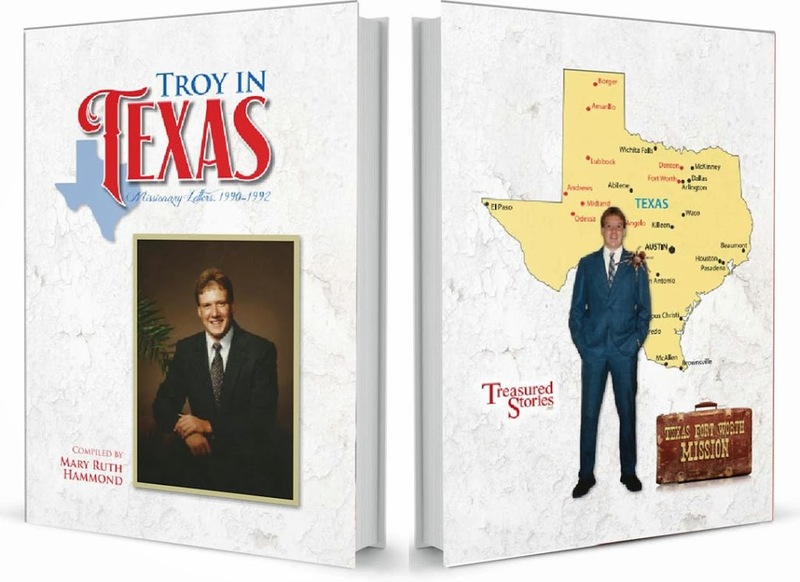 Truly, “Troy in Texas” is more than just a document of Troy’s mission. It was also a snapshot of their family and Grantsville history in 1991-92. Another joy was presenting the published book to Mary Ruth and her husband Tom. Finally, Mary Ruth’s wish “from the heart” had now come true! Congratulations to Troy and his family for publishing this amazing book. 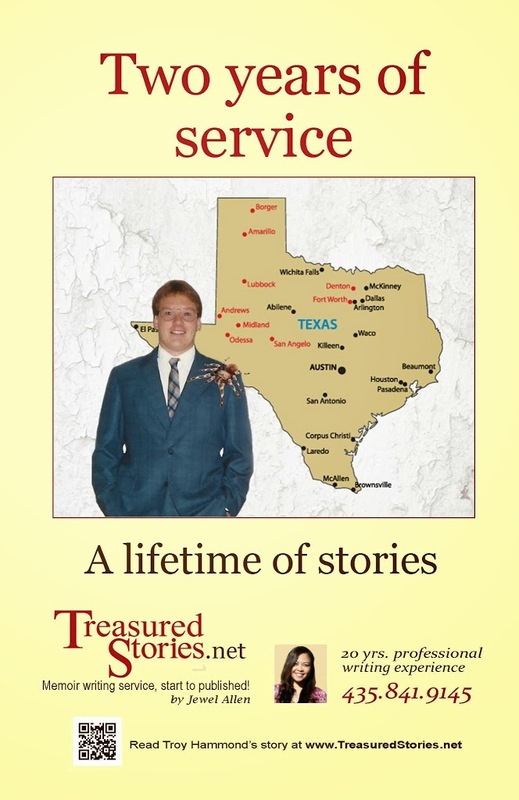 One of the things you’ll notice on Troy’s Treasured Stories poster (and the back of his book cover) is a tarantula photoshopped onto Troy’s shoulder. Down here there is a real problem with tarantulas. Not just little ones but BIG ones. Anyway, a couple days ago, Gossett caught one and took it home with him. He and his companion had a baptism that night so they put the spider into a brown grocery sack while they were gone, not realizing that a steel box probably wouldn’t hold that thing. When they got back to their apartment, the sack was empty and Gossett freaked out. They tore that apartment apart, looking for the spider and couldn’t find it anywhere. At about 11:00 p.m., they called and got us (me and Demes) out of bed to come get them because there was no way Gossett was going to sleep there with that thing roaming around. We got to their apartment and Gossett was standing on a chair in the kitchen, scared out of his pants. I figured he was exagerrating when he was telling us how huge this spider was and then, as calm as could be, my companion says, “Wow, no wonder why you couldn’t find it” and he pointed right above Gossett’s head on the ceiling. And there, crawling across the roof was the biggest, hairiest, ugliest spider I have ever seen. Gossett jumped down off that chair and me and him both were a block down the road by the time we stopped running. Well, we got rid of the tarantula and everything is back to normal I hope. I still get goose bumps thinking about that stupid thing though. Take care and watch out for spiders!